As if we needed any further reminders that it’s officially the best month of the year and Christmas is coming, a cute little reindeer is here to brighten your day. 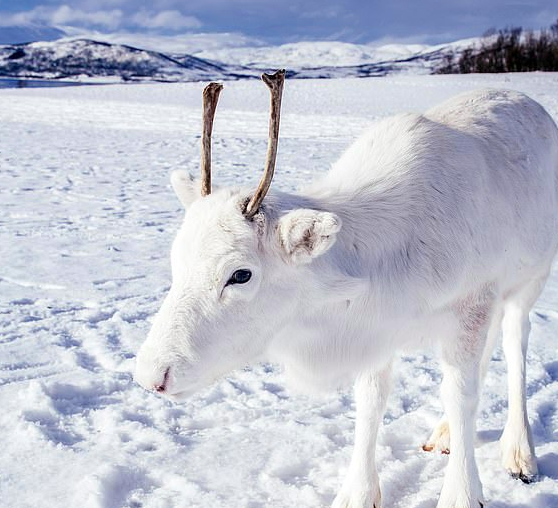 The rare white reindeer has been spotted in Northern Norway after it emerged from the woods with its brown mother. The calf was pictured in front of a magical snowy background, which it almost faded into because of its unique appearance. White reindeers have such an appearance because of a genetic mutation which strips their fur of any pigment, although they are not classed as albino as they still have dark pigmentation in their eyes and antlers. 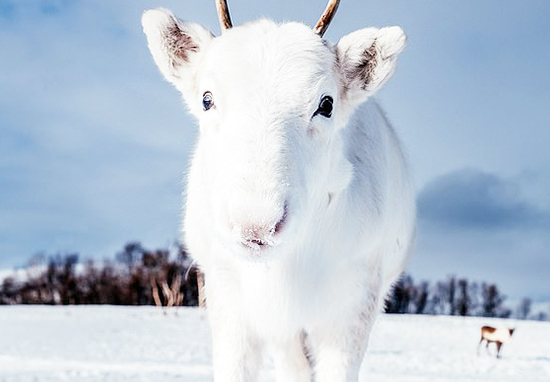 Photographer Mads Nordsveen, from Oslo, was on a hiking trip with friends when he spotted the white reindeer calf. Blue hour in Hamnøy, @Lofoten. The blue hour is one of my favorite times of the day. When the sun sets behind the horizon Its almost like a new day begins. I was walking in the mountains looking for nice landscapes for my travel photography when out of nowhere I saw this wonderful little creature. It’s estimated that this adorable reindeer would have just been a few months old when the photo was taken, as calves are born in May each year. He came very close to me and we looked at each other straight in the eyes. He was quite relaxed when he saw that I was calm and friendly. It was almost as if he posed for the camera. He was very curious and fun. Like a little explorer. After some minutes the mother of the baby reindeer came out of trees just behind. It walked around for some minutes before running back to its mother. It was very magical and a fairytale moment. Just look at it! My heart cannot cope with the cuteness. I’m hoping that this sighting is a sign that we will actually have a white Christmas this year. And if the Sami people are anything to go by, this could be true as according to them, white reindeer bring good luck and every herder should have one in their herd. Apparently, if you see a white reindeer, the sun and the moon all at the same time (a tad unlikely but hey hum), you will have good luck. Who wants to travel to Norway with me? I could really do with the good luck to be honest with you… Any takers? Ah well. 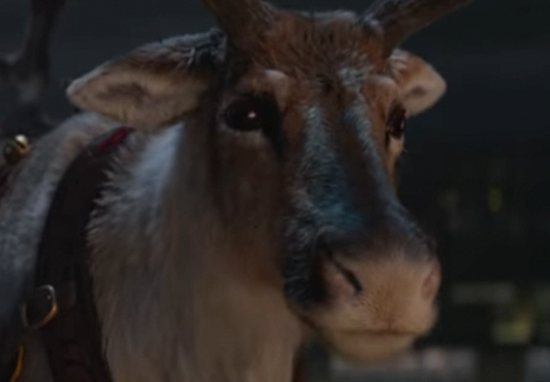 If you want to see some more adorable reindeers though, look no further than McDonald’s who have basically won Christmas with their festive advert. Showing Father Christmas delivering presents alongside his reindeers, he can be seen tucking into mince pies which have been left out for him. However, the reindeers are left out in the cold as no one has left them any treats. Come on guys, what were you thinking? Luckily though, Santa spots a McDonald’s in the distance and parks his sleigh up, before stocking up on bags upon bags of carrots. He then wishes Rudolph, Dasher, Dancer, Prancer, Vixen, Comet, Cupid, Donner and Blitzen a ‘Happy Christmas,’ as they happily tuck in. Although carrots wouldn’t be my first choice at Maccies, I’m well aware that Santa’s reindeers may not love nuggs as much as me.